@_@x Love the show, but don't love the dub. "You made the rain bleed!" Tomoe tells Kenshin after seeing him in action. Kenshin, also known as the Hitokiri Battousai, was the notorious assassin who fought to pave the way into the Meiji Era in 19th century Japan. He was feared by most, and the new government used him as their primary weapon to winning the war. It was wonderful to see this movie on DVD. The quality really enhances the beautiful animation. It's so pretty!! I especially love the way the sunlight shines on everything, and the water is breathtaking! The other backgrounds are very realistic. This anime stands out with its gorgeous animation. 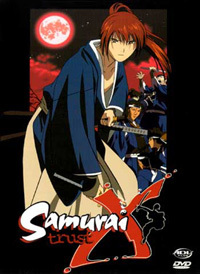 Included in the DVD are; the first two episodes, scene selections, dialogue in Japanese or English, subtitles, character introductions, some brief history, and the original trailer for the movie. I most enjoyed watching the character introductions. They tell a paragraph or two about each character and show a clip of them in action. My favorite is Hiko's. I just love how he slices that guy to bits! No, I'm not sadistic, really. The history was really easy to keep up with. Though I recommend reading the history first before watching the movie if Kenshin is something new to you. I watched the two episodes with my friend and he was scratching his head the whole time. Then afterwards we read the historical background, and he said "Ooooh, NOW it makes sense!". What was upsetting was the dubbing. For everyone else, it was pretty much intact. But Kenshin actually sounded like a man! I was very disappointed. I like the effeminate, yet strong voice given to him by Mayo Suzukaze in the original Japanese format. How dare they! Trying to change my Kenshin!! After seeing the dub I had to watch the Japanese with English subtitles format twice so I could block the awful manly voice. I prefer the original because it gives him character. It adds almost a sense of irony since he is a deadly assassin with a somewhat feminine voice. Like he kills, but he is killing to bring forth peace for the people. See? I didn't get that same feeling when watching the English dub. Oh and the titles could have been better. I mean, Trust? I didn't figure out its meaning until I found out that the second volume is called Betrayal. The first episode is called "The Man of the slashing sword" I don't think I really have to point out what all is wrong with that one. The second one is called "The Lost Cat". What cat? Is this supposed to be an expression of some sorts? Is the cat supposed to represent Kenshin? or Tomoe? I just don't get it. Overall though, I liked this volume. Then again, I am just happy to see something Kenshin. The titles made me cringe, as did Kenshin's English dubbed voice. But other than that, it was pretty good. The dialogue stayed accurate with the original, the plot was the same, nothing changed, not even the names! So I guess my best advice for watching this is to ignore anything English...except for the subtitles of course, you might need those.